The human mania for classification manifests itself in countless ways, and one of the more peculiar is somatotyping: organizing people by body shape, usually with the belief that there’s some correlation between body shape and personality. These types tend to come in threes. In The Antichrist Nietzsche wrote that “In every healthy society there are three physiological types, gravitating toward differentiation but mutually conditioning one another . . . : those who are chiefly intellectual, in another those who are marked by muscular strength and development, and in a third those who are distinguished in neither one way nor the other, but show only mediocrity.” But this isn’t very helpful. Nietzsche doesn’t describe what the intellectuals look like, and there are many ways to be physically mediocre. In the twentieth century two influential typologies arose, one by the German Ernst Kretschmer and one by the American William Herbert Sheldon. Their systems are quite similar: Kretschmer’s athletic-aesthenic-pyknic maps pretty directly onto Sheldon’s mesomorphic-ectomorphic-endomorphic. Muscular, skinny, fat. Kretschmer and Sheldon both believed that each body type was closely associated with a personality type: in general, mesomorphs are assertive, ectomorphs are timid and private, endomorphs are gregarious. There’s nothing scientific about all this, of course; Kretschmer and Sheldon alike were simply drawing on the kind of folk wisdom that doesn’t bear up to serious scrutiny. But I think that if we’re honest we’ll have to admit that we’re all prone to doing such typing, if only half-consciously. Once the idea that fat people are jolly, or that introverts and cynics are cadaverous, gets into your head it’s hard to get it out again. Once I saw a performance of Twelfth Night in which the misanthropic Malvolio was played by a tall and hefty fellow, and despite the actor’s evident skills I struggled to conquer the cognitive dissonance. We can take it as axiomatic that professional athletes will be mesomorphs — but some are more mesomorphic than others. And they can be mesomorphic in different ways. American football players tend to be thick, stout; basketball players long-limbed and lean. If a football player seems slender to us, that’s usually because we’re seeing him in comparison to other football players. Yes, there’s a significant difference between a cornerback and a defensive tackle: but not nearly as much as there is between either of them and a a random selection of the population. Basketball players have an even smaller standard deviation from the mean. One of the things I like most about baseball and soccer is the wide range of body types involved. In baseball, even players with very similar skill-sets can look wildly different. Left-handed power pitchers? Ron Guidry and C. C. Sabathia. Right-handed sluggers? Hank Aaron weighed 175 pounds for most of his career, just a smidge less than Mark McGwire. Similarly, what does a center-back look like: Rio Ferdinand or Fabio Cannavaro? 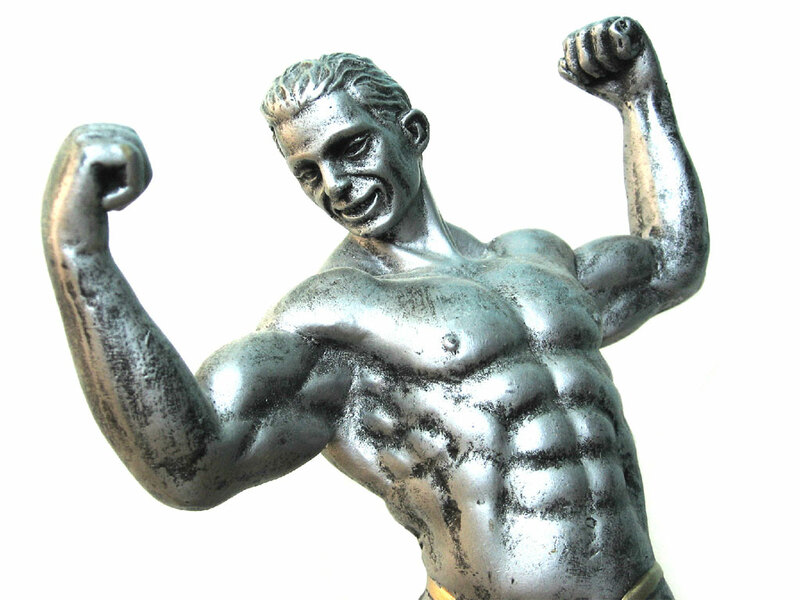 And which is the model for the striker’s somatotype, Michael Owen or Zlatan Ibrahimovic? The prototypical midfielder: Luka Modrić or Sócrates? Goalkeepers tend to be more predictably shaped, for obvious reasons, but Iker Casillas is less than six feet tall, and Jorge Campos was, what, 5’7″? In fact, the peculiar demands of soccer tend to yield some odd body types — people shaped a little different than the people we see on the street every day. One of the most common is the bifurcated ectomorph-mesomorph: a skinny upper body bolted to thickly muscled legs. Arsenal has two of these, Arshavin and Wilshere. Messi dominates this category, of course. Maradona was similar, but with his round arms and short neck you could tell that he would end up putting on weight some day. Pelé of course had those tree-trunk legs, but with a stronger upper body. Pelé’s build, in fact, is what has become prototypical for an NFL running back: powerful thighs and a low center of gravity but with enough upper-body strength to shrug off high challenges. It’s so perfect a build for soccer that it’s always a little surprising to see true greatness in players who deviate from it significantly. The less significant deviation is that of, say, Puskás — the “little fat chap,” as an English player supposedly called him when the Hungarians took the pitch at Wembley in 1953 — since we have often seen how the thickly-built mesomorph ages into a pudgy endomorph. No, it’s the ectomorphic genius who surprises the most. How did Cruyff and George Best avoid having their skinny little legs snapped by tackles? How did they, with their manifestly high centers of gravity, maneuver their way so consistently around players who certainly looked as though they ought to be quicker? Maybe there’s not as close a correlation between body type and skills as we’re prone to think. And if that linkage is dubious, what about the alleged correlation between soma and psyche? Does a soccer player’s body shape tell us anything about his personality type? That may well be a topic for another post. To summarize then: footballers have different body types but there are certain forms that consistently appear and there are a few outliers. A lot more needs to be done to make this piece as thought provoking as the best articles on this site. And you forgot the diesel truck that was Gerd Muller as one of the great examples of unorthodox bodies that performed beyond comprehension. I appreciated the effort of this post to trace a symmetrical study of physical type and style of playing. These subjects and themes–snapping, as well as speed, flight, and movement–and their implications–spontaneous, loose, and unpremeditated–were all part of the amateur’s vocabulary of football. But in the wake of the carnage of Madrid-Barcelona rivalry, many viewers are becoming fascinated with recording scenes of active, exuberantly enjoying soccer, in contrast with the hypnotic web of the tika taka. Since you mentioned Puskás, I think it is important to say that his ‘social body’ was at the center of a celebration of an idealized youth that resonated with many Hungarian artists of the time. (So much so, that when Puskás gained visible weight in Sanremo, before signing for Real Madrid, his distorted image was almost a symbol of the defeated and diminished status of Nagy’s short-lived government.) If you look at the heroic, striding, often Cezannesque male nudes of photographers like the early Andre Kertesz, one could see how through flexile players such as Hidegkuti, the pioneer of the “false nine,” a new type of man could be realized: Icarus-like, an idyllic vision of the unity of man and nature. Cruyff and Best seemed sometimes to move about in a controlled fall, seemingly stumbling through the opposition. You see other supreme dribblers of that bodytype sometimes do the same, though I can’t think of a current player of that type off the top of my head. @Kári Tulinius Off-topic, really, but every time I watch that Cruyff compilation, which I’ve done about a hundred times, the thing that always catches me is how fast he was. Which in turn makes me ask: Among the truly great players, who was the fastest sprinter? As we might ask here in America, who would have had the best 40 time? @Stefano Gulizia A beautiful response! Just how good is Silva? @Alan Jacobs Not many great players were noted for their speed. Klinsmann is the only one who comes to mind. That may be because speedy players are more damaged by injury than others. Torres and Overmars could both have been indisputably two of the all time greatest players, but for injuries. @masqueunjuego That’s a good point. He’s got that build, though he’s not as prodigious a dribbler as Best and Cruyff, but then awful few players are. @stephan To me, Cristiano Ronaldo feels like an ectomorph with a lot of self-belief. Speed for a footballer is useful, but it’s usually only useful at the winger position in the modern game, and that’s a position that really only exists in the 4-4-2. In addition, it’s tough to base a career on speed, since that’s the trait that declines first in any good player. A player like Ryan Giggs is still playing because he made a conscious decision to retool his game after suffering from injury woes early on, which were almost certainly exacerbated by his pace-based style. It seems that we’re most concerned with speed in the US and in England. There have historically been a few “ectomorphic” footballers who used their speed, but I’d wager that most of them depended far more on technique. I’m pretty sure Eusebio was the fastest U-19 Portuguese in the 100, 200, and 400 meters. I’d imagine his 100 meter time wasn’t far off world record pace at that time (Jim Hines was the fastest man of Eusebio’s time). Most center backs don’t look much different than any other player on the pitch, physically, but seem somewhat “rooted” when chasing opposing strikers or midfielders down the pitch. It actually gets under my skin. Center backs like David Luiz who seem like they are almost moving in slow motion but are actually moving twice as fast as I could move on my best day. @Kári Tulinius I haven’t seen a lot of him yet, but Neymar seems to have the same crazy speed / controlled falling while dribbling skill. @Alan Jacobs – pre-weight Ronaldhino had the most ridiculous trunk to upper body physique I’ve ever seen. And young Michael Owen has to be in the mix for fastest player. Sir Matthew Le Tissier defied classification for me. With a centre of gravity at about his Adam’s apple and with the legs of a milkman, he gave hope to [numbers] of ageing fathers across [the nation] that one need not train ad nauseum, or live on birdseeds so long as you can ping it in from 30 yards. On the falling/dribbling discussion, Ginola’s drop of the shoulder was a thing to behold. More than once I found myself being “done” from the comfort of my own sofa. Long term reader, terrific site. @matt I have a DVD compilation of Eusébio’s career. One of his early coaches in Mozambique says he could run 100 metres in less than 10 seconds. Or was it 11?… Anyway, an impressive mark. Running really fast makes for good youtube videos for the easily entertained, however it is an over rated attribute in footballers. It’s much more important to think quickly and make good decisions than running like hell. @Alan Jacobs According to rumor, the fastest player is Dennis Bergkamp. Faster even than Henry in a straight line. @Marshall Leaman how did ronaldinho have the most ridiculous physique? just curious to know what you mean, as im not quite sure i do. Didn’t mean to derail my own post by the pace question, but while we’re on that topic someone needs to mention Joe Hart. @Josh older than that. I heard that he was the quickest in the late nineties- we might have been talking to the same person. This was really good, yo. Listening to our broadcasters, it seems in America we have to ask "How pacey is he?" because everyone talks like that about soccer. Unfortunately, you still cant find many whove watched a Yanks-Sox tie. All I have to say about body size is this: Lionel Messi, Juan Mata, Sergio Aguero and David Villa. I also have to say this: Drogba, Gerrard, Vidic, Terry. These are two different body styles and yet they BOTH WORK!!! You can be successful no matter your body type if you are willing to put the work in.